Remember remember THIS is NUCLEAR AWARENESS MONTH. Many have already turned stupid and died. Don’t join ’em yet. #DodgeTheRads! PS FIGHT CENSORS – SUBSCRIBE to Bob Nichols articles TODAY! SHARE TODAY in your FB groups, but Lucy can’t, due to relentless censorship issues! “…Other radiation species are also Withheld by the US. That should be crystal clear now for most Americans. ALL NUCLEAR REACTORS LEAK ALL OF THE TIME! The RadParticles have to stop going up over there before they stop coming down over here. Saying it is pretty simple, making it happen is not. The radiation is so intense in the reactor buildings it kills humans in seven minutes, robots are dead in two hours. Share as a public service message by Lucy Occupy and Friends, in compliance with copyright permissions. Everybody must do their shares. Tags: "Fukushima Liability set by Japanese Court", "Morons who accepted “invitation” to witness nuclear detonation. Would you? ", "Read it and weep. It is a done deal and cannot be changed. ", "This is a Bad situation for all exposed to the Rad. 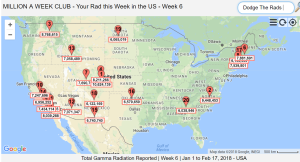 ", #DodgeTheRads, 10 cities MISSING REPORTS | MILLION A WEEK CLUB - Feb 24, 2018 - USA, Eco Health Alliance interactive map of killer viruses, Eleven Years of Annual US Radiation Reported Totals, Nichols on Nuclear, NICHOLS ON NUCLEAR - Your Radiation This Week YouTube, Nuclear, NUMBER OF MILLION COUNTS A WEEK CITIES ZOOM IN THE US, Radiation, STERILIZE THE PLANET by Bob Nichols, Target Population, THIS is NUCLEAR AWARENESS MONTH., Total Gamma Rad History since 2006, TOTAL GAMMA RADIATION RECORDED IN THE US – 2017 Final Rad Count, We are the Media Now, Where's the BETA?